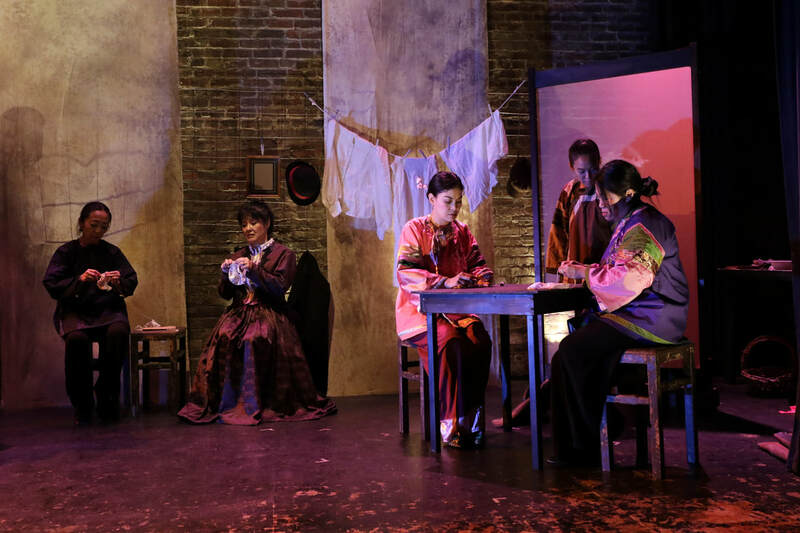 Bo (Rinabeth Apostol) schools a customer (Lily Tung Crystal) while Mui (Christine Jamlig) and Crow (Keiko Shimosato Carreiro) take cover and Daisy (Lisa Hori-Garcia) sneaks a peek. 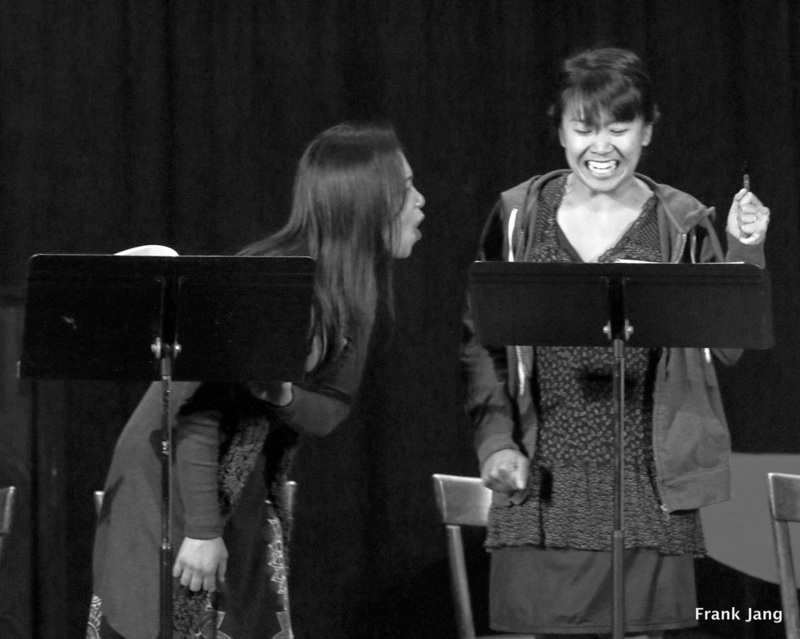 Mui (Christine Jamlig) and Daisy (Lisa Hori-Garcia) meet cute. Ho and her sidekick Crow assess the audience. Madame Ho's daughter Daisy. Her pride & joy. L-R: Lily Tung Crystal, Keiko Shimosato Carreiro, Lisa Hori-Garcia, Mimu Tsujimura, Bonnie Akimoto, Christine Jamlig. Happy times at the Madame's. Mother & daughter dance! Ho and Crow befuddle the Jesus Lady. Musician Alan Yip sets the mood -- and watches over. Numbah Three needles new girl Rose of the Lotus Feet, whom Ho serves the good vittles, while Daisy sneaks a peek. Madame Ho dreams big in America with husband Bo. Ho instructs her women in the domestic arts -- fine crochet and song. But don't mess with them! ​"Behind Asian Eyes, A World of Possibility." 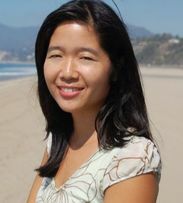 ​Madame Ho, trafficking, and the making of San Francisco. 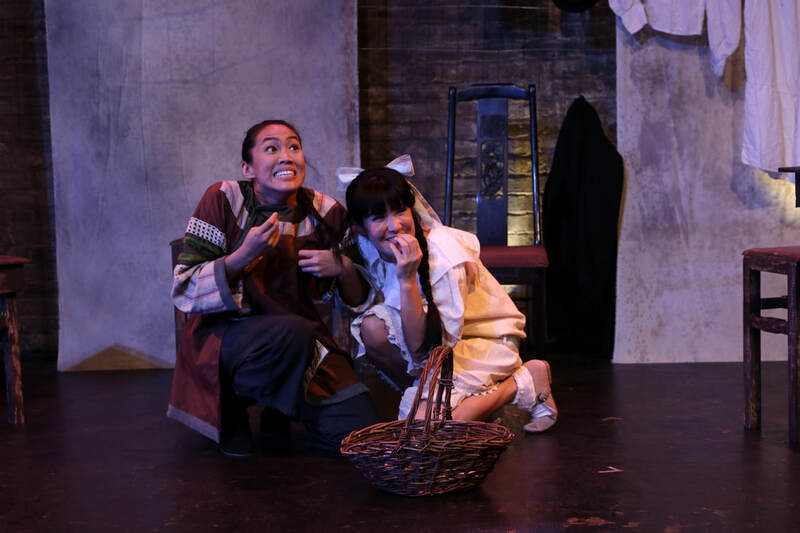 Servant girl Mui (Christine Jamlig) and Daisy, Madame Ho's daughter (Lisa Hori-Garcia) giggle it up. 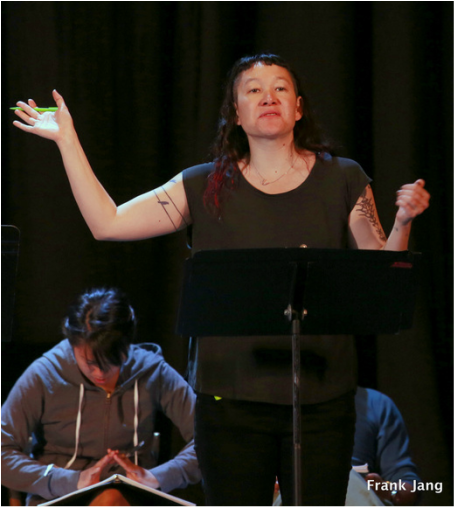 ECTP is honored to be able to provide free community performances at Donaldina Cameron House, a bilingual social service agency empowering San Francisco's Chinatown community to live healthy, thriving lives. 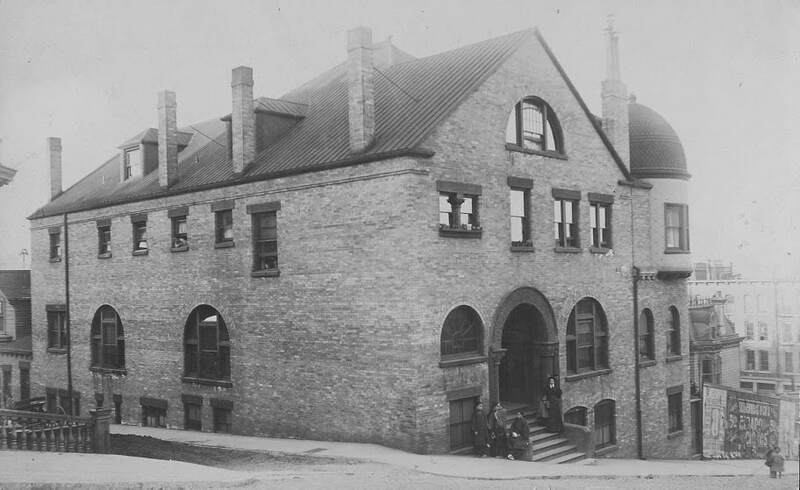 ​​Cameron House originally began in 1847 as the Occidental Mission Home for Girls, to help exploited Chinese immigrant women sold into prostitution. In 1942, it was renamed in honor of Donaldina Cameron, a young Presbyterian woman who made it her mission, along with founder Margaret Culbertson, in the 1890's to help, educate, and house these vulnerable women. It is likely that my great-grandmother, being a madam, had to confront the zeal of Miss Cameron. History comes full circle with this production. The Brilliant Cast of Madame Ho Welcomes You! 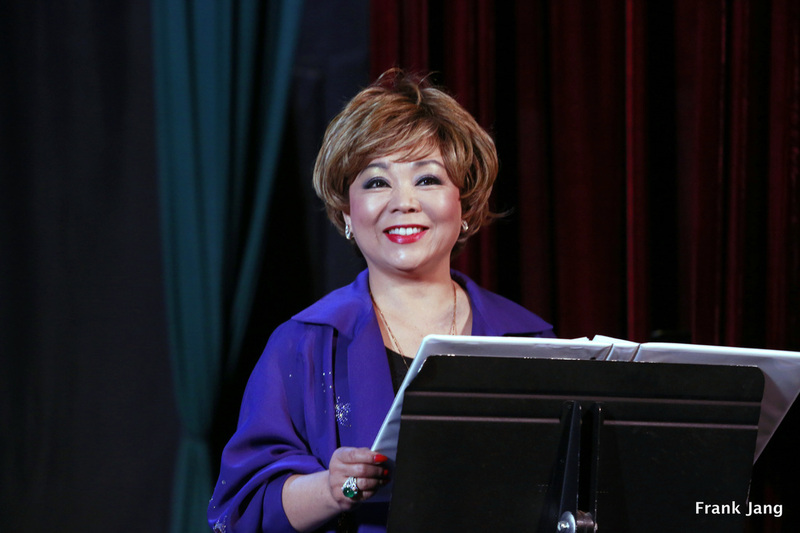 Madame Ho had a stellar Opening Week at the EXIT Theater and closed our last weekend with sold out houses. Fans, friends, and family came from near and far. Helen Chan, Eugenie's 96-year old mother, and the source of many of the shards of Chan history that inspired the play, graced the theater twice with her presence, gave the show her "thumbs up," and scolded Eugenie for seating her too close to the stage. and has been honored with the 2017 Rella Lossy Award! 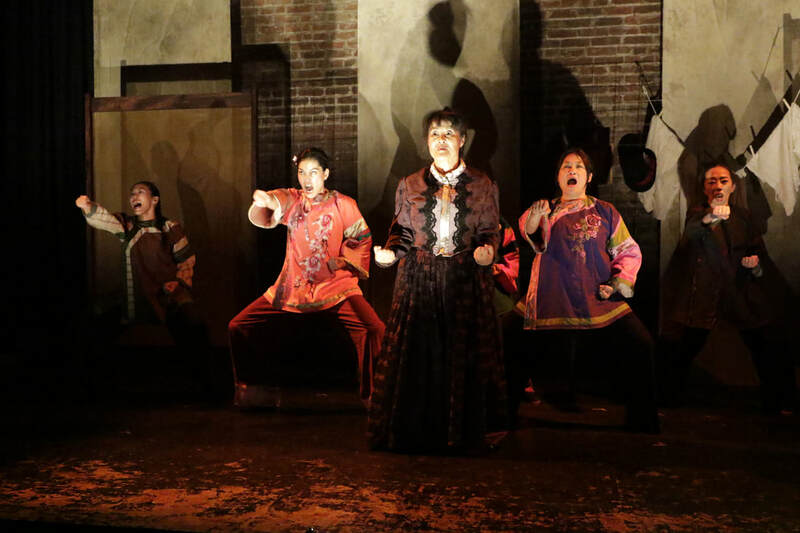 Check out what Broadway World is saying about Madame Ho! ​Announcing the amazing artists of Madame Ho at the Exit Theatre and Cameron House! 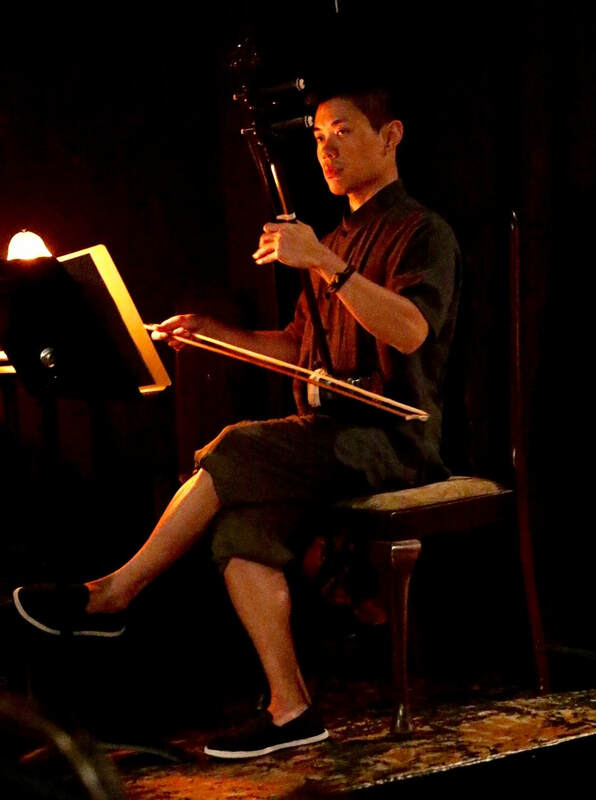 ​Featuring: Bonnie Akimoto, Rinabeth Apostol, Lily Tung Crystal, Lisa Hori-Garcia, Christine Jamlig, Keiko Shimosato Carreiro, Mimu Tsujimura, and erhu musician Alan Yip. ​Songs by Byron Au Yong. 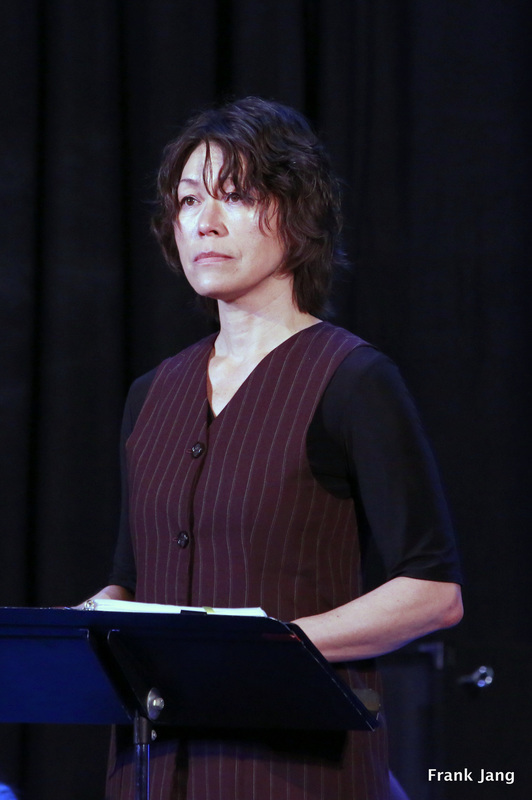 Lighting designer Allen Willner, scenic designer Randy Wong-Westbrooke, and costume designer Keiko Shimosato Carreiro round out the creative team. 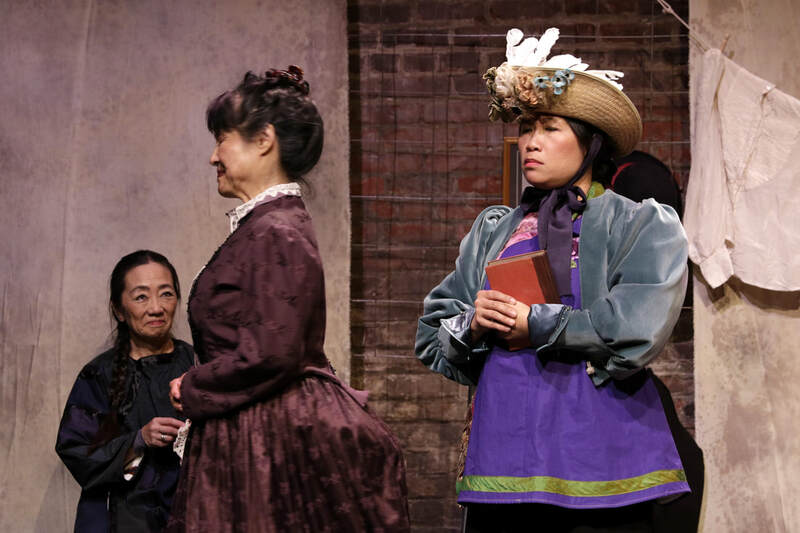 "The Church Lady Pays a Visit to Madame Ho"
​In May 2016, ECTP produced an English-Chinese reading of Madame Ho, the play inspired by the life of my great grandmother, a Barbary Coast madam and single mother, at the historic Great Star Theater in San Francisco’s Chinatown. What an amazing cultural and community event! 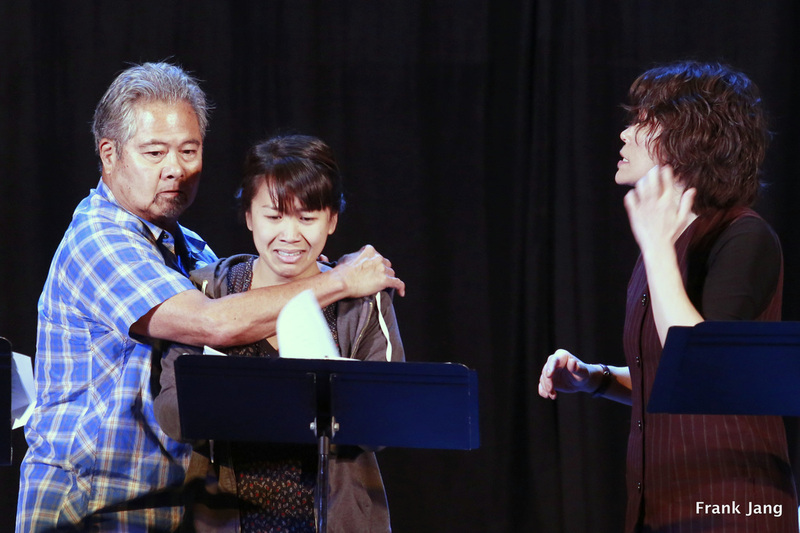 On stage, we were graced by an all-star cast of Bay Area actors -- Katherine Chin, Monica Ho, Lisa Hori-Garcia, Gwen Loeb, Josephine Ma, Randall Nakano, Erin Mei-Ling Stuart, Mia Tagano, Mimu Tsujimura, Ogie Zulueta​, directed by the excellent Jessica Heidt, dramaturged by the insightful Sonia Fernandez, and narrated in Cantonese by the fabulous Maggie Wong. In the audience, an awesomely diverse crowd of friends, family, theater folk, history buffs, seniors, and community members coming straight from the Stockton street markets with their groceries. ​My kind of crowd -- It felt like home. Check out these photos from the read​ing. Madame Ho contemplates her daughter's life. The Narrator invites us into Ho's story. Madame Ho's husband, Bo, procures reluctant slave girl Rose at auction. Madame Ho's daughter Daisy and servant girl Mui huddle for safety. Numbah 3 slave girl lashes out at reluctant Rose. Crow, a wise woman, tells it like it is. great-grandmother, Madame Ho tells the story of a formidable Barbary Coast, San Francisco brothel madam, single mother, Chinese immigrant, and ghost -- who tries to raise her daughter right. A tale of survival and complicity. Why I Wrote this Play: For years as a kid, I would hear rumors of my father’s family’s tainted past. That my great-grandmother was a brothel madam. Aunts would shoo away a flamboyant uncle who dared tell such tales at the teen table. My mother who married into the family was straightforward: It was a way to survive. I wondered what it was like for this great-grandmother to raise a family while running this business. And to do so with the highest regard for her children’s future in the segregated world of the late 1800s. Thus, Madame Ho was born. Development History: Great Star Theater (dir. Jessica Heidt) 2016; New Dramatists (dir. Mark Wing-Davey) 2014, (dir. Kenneth Prestininzi) 2013, (dir. Ken Rus Schmoll) 2012; Great Plains Theater Conference (dir. Elena Araoz) May 31, 2013; Magic Theatre (dir. Wolfgang Wachalovsky) 2013, (dir. Jessica Heidt) 2012: Cutting Ball Theater (dir. Rob Melrose) 2011: Playwrights Foundation (dir. Marissa Wolf) 2011. ​Help bring Madame Ho to life! Make a tax-deductible contribution now.